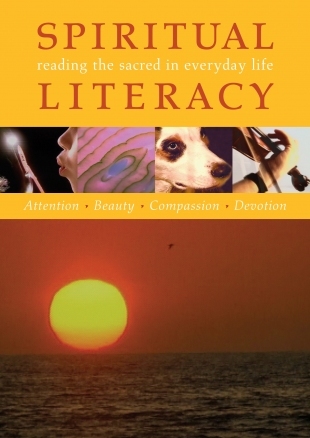 Frederic and Mary Ann Brussat's bestselling book Spiritual Literacy is an unprecedented collection of "aha!" passages by teachers of all spiritual traditions that reveal the sacred meanings in today's world. For this exquisite 6 DVD series, award-winning filmmaker David Cherniack has married those inspiring words to sense-luscious visuals and emotionally vibrant music, creating 26 meditative and soul-stirring half-hour films. Here is a wedding of spirituality and imagination sure to guide, challenge, comfort, and encourage you on your journey. This innovative series is organized around a new alphabet of 26 spiritual qualities of mind and heart for practicing spirituality in everyday life. Purchase individual DVDs or the entire series. Many spiritual teachers are quoted in the Spiritual Literacy DVDs — 15 - 20 per episode. On the DVDs, each reading is a separate scene, so you are able to easily jump to any one that you would like to see again. Attention: Spirituality is the vital awareness that pervades all areas of our lives. Paying attention is the first step, no matter what we are doing. Beauty: God's handwriting can be appreciated everywhere, including in such unexpected places as a wild animal, an onion, and traffic. Compassion: Images and words evoke and illustrate the quivering of the pure heart in response to the suffering of others, a quality treasured in all the world's religions. Devotion: Devotional moments are found in formal prayer but just as often emerge out of such everyday activities as cooking, raking, and even shopping.